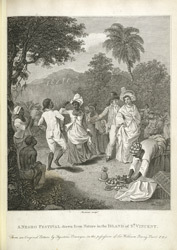 This illustration of a festival is taken from Bryan Edwards' 'The History, Civil and Commercial of the British Colonies in the West Indies.' People who were brought to the Caribbean as slaves were taken from a wide variety of places in west and central Africa; they represented many different cultures and spoke many different languages. Dance and music were therefore important to them as a means of communication. The celebrations were based on African traditions but often also included new elements assimilated from the Europeans.